Summer is here and that means it’s time to get prepared for festivals, road trips, and bonfires. It’s the time of year where we start spending a lot more time near our oceans so this year I hope that you will keep the environment in mind during your activities. There has been so much awareness around plastic pollution and the effects that sunscreen has on ocean creatures. So here are my summer essentials to avoid plastic and save our coral reefs. Raw Elements sunscreen is packaged in in a recyclable/reusable tin. This formula is made from certified all-natural ingredients and provides UVA-UVB true broad spectrum protection. This zero waste sunscreen is very water resistant beyond 80 minutes, yet gentle and moisturizing enough to use for kids. Packed with biologically active antioxidants, vitamins, minerals and extracts, it continues protecting your skin long after environmental exposure. See my full review of this sunscreen on YouTube here. 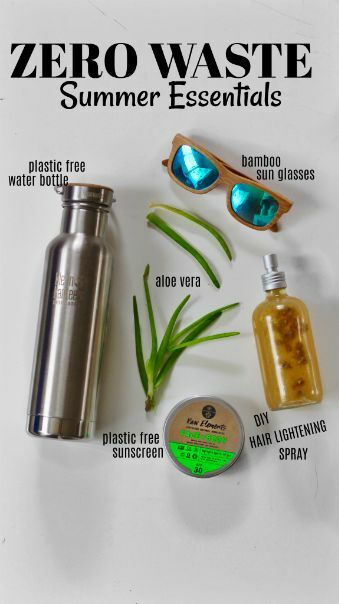 Choosing sunglasses made from bamboo is a phenomenal way to avoid plastic. Bamboo is a renewable resource that grows back after it is cut much like the grass in your backyard. It won’t break down into toxic micro plastics in the unfortunate case they fall off in those beachy waves. And an added bonus, they float! Water is a the most essential thing when you’re outside in the summer heat. Staying hydrated can mean the difference between enjoying yourself, or having a piercing head ache. Make sure you stay hydrated with your reusable water bottles. This Klean Kanteen is plastic free, but any bottle you already have will do. Worried about refills? Grab a large cooler and fill it with cool water before you go, that how we did it “back in the day.” We’ve all seen the heart breaking photos of sea life being caught in plastic nets and plastic straws being stuck in places they shouldn’t, so let’s be sure we do out best to avoid contributing to that massive problem. This one may not be essential for everyone, but it a must for me. I have been using my own spray to lighten my hair for years! This is a simple blend of chamomile, lemon, and olive oil. You can see the full recipe and explanation for why it works in this video. I stopped dying my hair when I found out how toxic the chemicals are to myself and the environment so if you’re looking for a natural alternative, I’ve got you covered! After a long weekend in the summer sun, you’re likely going to have a bit of heat held within your skin. Aloe vera (especially when kept in a cool place) can be the icing on top of a great day at the beach. Aloe vera is a natural remedy for sunburns, but it also possess an infinite about of benefits for the health of your skin, if you’re looking for a natural, zero waste moisturizer! You can pick up a plant at almost any home ware store and it makes for a beautiful decoration during it’s off-season! I hope you have an amazing plastic free/ zero waste summer! For more tips be sure to follow me on Instagram (@shelbizleee). It does way more than just what a regular toothbrush does and u dont need a toothpaste! Is it possible for you to make a video that can help a clueless person such as myself with composting?